For decades sport has been recognized as a way to build peace and cooperation among diverse people (that is why the Olympic Games began). Recognizing the value of sport in developing peace, the United Nations has marked April 6th as International Day of Sport for the Development of Peace. Helps connect students who speak different languages: Sport and games are themselves universal languages; once you know the game, you don’t need to talk too much – just play! ITS FUN! Laughter, play and friendly competition is just plain fun! 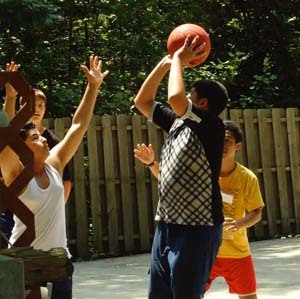 Ready to play with other youth from around the world this summer? Join us and register now! April6.org – platform with listing of sport events in celebration of the International Day of Sport for the Development of Peace – plan a sport event for April 6th and add it to the list, or find an event near you!